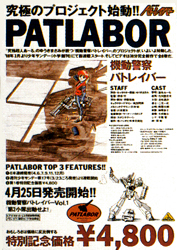 This section contains examples of promotional Patlabor related items. 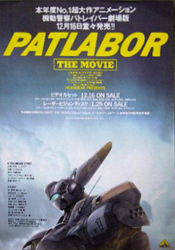 Most of these items aren't meant for the general public, but were produced for retailers, the media and to promote Patlabor to the public. 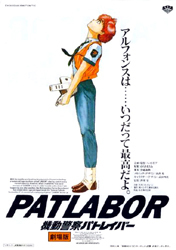 It is by no means an exhaustive list, but instead I've tried to highlight some of the more interesting items I've come across. 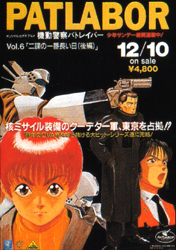 Notes: A four page press sheet issued by Bandai Visual/Emotion in 1988 for the original OVA series (AKA Early Days). 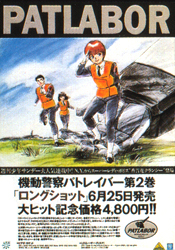 Contains synopsis of the series, releases dates for the videos and character and staff profiles. 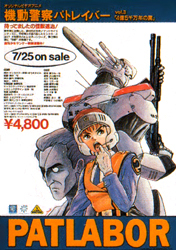 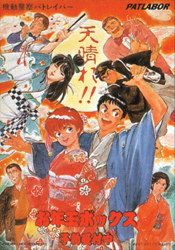 Left to right; flyer for the first episode of the original OVA series (Bandai Visual, 1988), a flyer for "Vol. 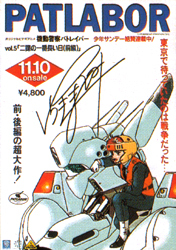 1½: Trends and Countermeasures" video tape (Warner Pioneer, 1988), and flyers for the second and third original OVA series releases (Bandai Visual, 1988). 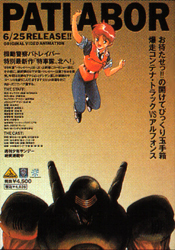 Left to right; flyers for the fourth to sixth original OVA series releases (Bandai Visual, 1988) and a flyer for the "Vol. 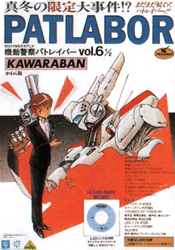 6½: Kawaraban" video release (Bandai Visual, 1988). 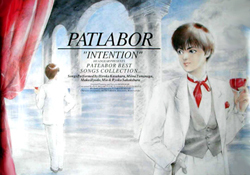 Left to right; poster for both the fifth and sixth original OVA series releases (Bandai Visual, 1988) a flyer for the seventh original OVA series release (Bandai Visual, 1988) and a poster for the "Intention" soundtrack album release (Warner Pioneer, 1989). 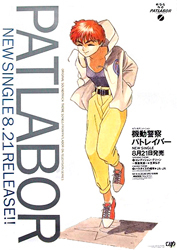 Left to right; a flyer for the second original OVA series release with release dates for the rest of the series, highlighting a premium item for pre-orders, a special binder (Bandai Visual, 1988), a flyer for the original OVA series releases bringing in the new year of 1989 with the release of a case to hold the laserdisc releases of the series (Bandai Visual, 1988), a flyer for the theatrical release of the first movie (Shochiku, 1989) and a an alternate poster for the theatrical release of "Patlabor the movie" (Shochiku, 1989). 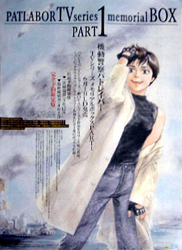 Left to right; poster for the first episode of the original OVA series (Bandai Visual, 1988), a poster for the second original OVA series volume highlighting a premium item for pre-orders, a special binder (Bandai Visual, 1988), a large cloth banner for Shonen Sunday used outside of book shops (Shogakukan, 1988) and a poster for the release of a case to hold the laserdisc releases of the original OVA series (Bandai Visual, 1988). 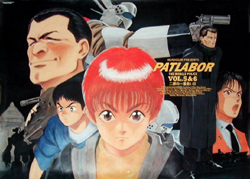 Left to right; poster for the video release of "Patlabor the movie" (Bandai Visual, 1989), a poster for the "Condition Green ~Kinkyou Hasshin~" and "Paradise no Kakuritsu" CD Single (VAP, 1990), a poster for the video release of volume one of the TV series/New OVA Series (Bandai Visual, 1990) and a poster for the release of the twelfth volumes of the video release of the TV series/New OVA Series (Bandai Visual, 1991). 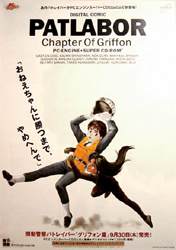 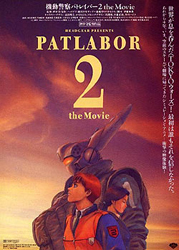 Left to right; poster for the video release of "Patlabor Music Clips" (Bandai Visual, 1992), alternate poster for the theatrical release of "Patlabor 2 the movie" (Shochiku, 1993), a poster for the release of PC-Engine game "Chapter of Griffon" (Riverhill Soft, 1993) and a poster for the releases of the "Early Days" and "Movie Complete Works" laserdisc box sets (Bandai Visual, 1995). 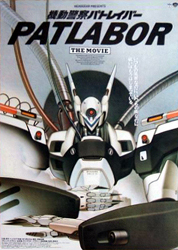 Left to right; posters for the video releases of the TV series and New OVA Series laserdisc boxes. 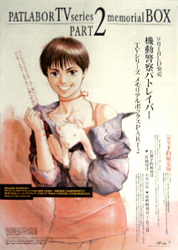 Why Noa is holding a pig in the second poster is anyone's guess. 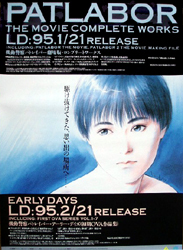 One of the LD sleeves in this box set also featured Ota as a cowboy riding a horse (VAP, 1995). 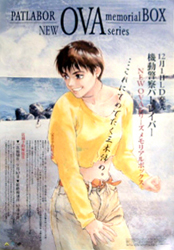 The final poster is promotional art created for the Manga Film Festival at the ICA in the UK by a British artist. 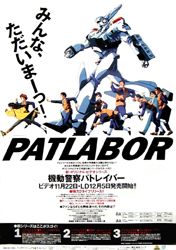 It was later used for a promotional poster for the first two Patlabor film's UK video release (Manga Entertainment UK, 1995). 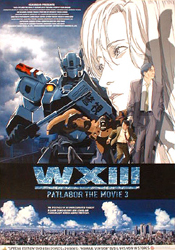 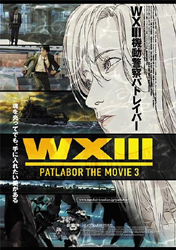 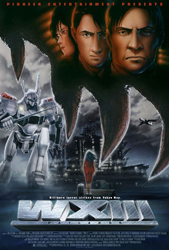 Left to right; alternate theatrical poster for "WXIII Patlabor the movie 3" (Bandai Visual, 2002), poster for the video release of "Minipato" (Bandai Visual, 2002), a poster for the video release of "WXIII Patlabor the movie 3" (Bandai Visual, 2002) and a poster for the US theatrical release "WXIII Patlabor the movie 3" (Geneon Entertainment USA, 2003). 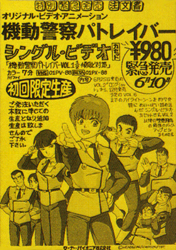 Notes: The reverse side of the flyers for the video releases have pre-order forms for retailers. 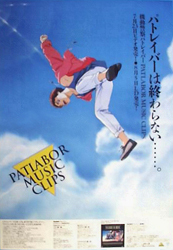 Just fill it in and pick up your video from you favourite video shop on the day of release! 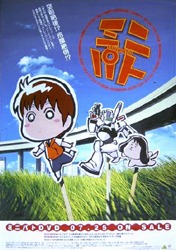 A GWEI Product. 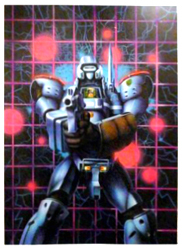 ©2003 - 2018 GWEI. 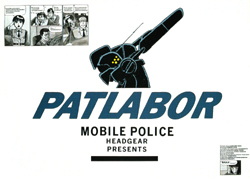 Mobile Police Patlabor ©1988 - 1994, 2002, 2014 - 2016 Headgear/Emotion/Bandai Visual/TFC/Shogakukan/NTV/Production I.G./Akemi Takada/Masami Yuuki/The Next Generation - Patlabor - Production Committee/Khara. 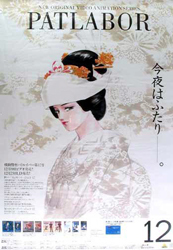 All other logos/trademarks are copyright of their respective owners/companies. 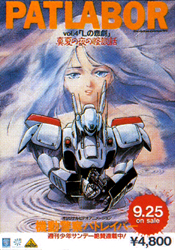 Used for review and illustration purposes only.